For many modern homes, the bath is no longer just a utilitarian stop-off. It also can be a retreat and personal space that provides comfort, luxury and relaxation. 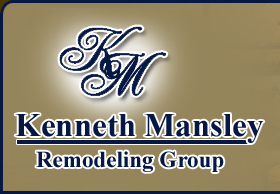 We at Kenneth Mansley Remodeling Group can work two ways: 1) Refresh your current space, leaving the same layout of counters, tub, shower and toilet, or 2) start with a blank canvas to create a whole new look, complete with new custom cabinetry or semi-custom cabinetry. If space allows, we can make your bath area larger, like those found in many of the new homes today; some baths are even larger then their adjoining bedrooms! Many designs nowadays include oversized tubs, separate his and hers showers, dressing tables and even a nook for gym equipment. It really can become a destination place in your home! The makeover process starts with a visit and a look around the bath. You’d be surprised at how just a little creativity can turn an ordinary or out-of-date space into one of the most beautiful spots in your home. Even a small bath can be made to look bigger with mirrored walls and better lighting. In addition, materials of every texture, style and shape can beautify floors and countertops. Sound exciting? Take the first step by calling us today at 610-294-3068 or fill out and submit our project estimate form for a complimentary in-home consultation.